Description: Four issues of the quarterly journal of Catholic theology. Vol 22, no 4 (1995 Winter - Youth and the Meaning of Life). Very minor wear to wraps. Interiors are bright and clean. 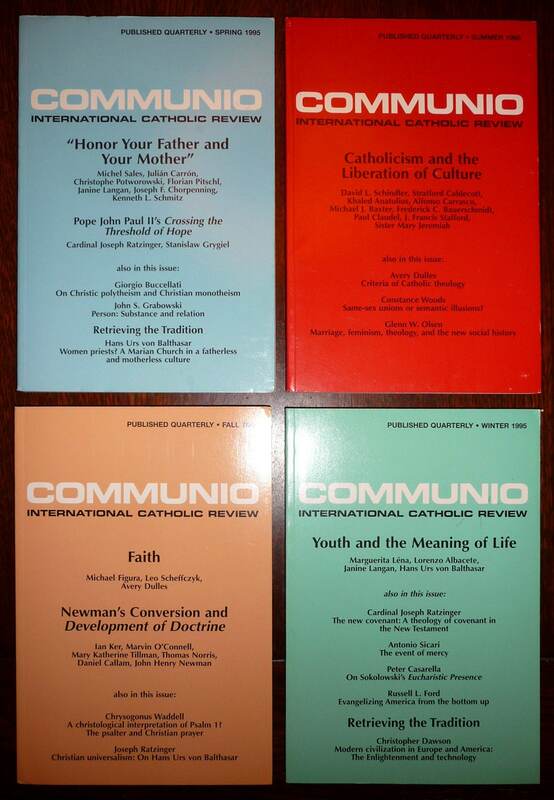 Featured articles by Michel Sales, Julian Carron, Christopher Potworowski, Florian Pitschl, Janine Langan, Joseph Chorpenning, Kenneth Schmitz, Cardinal Joseph Ratzinger, Giorgio Buccellati, John Grabowski, David Schindler, Stratford Caldecott, Khaled Anatolios, Alfonso Carraso, Michael Baxter, Frederick Bauerschmidt, Avery Dulles, Constance Woods, Glenn Olsen, Michael Figura, Leo Scheffczyk, Ian Kerr, Marvin O'Connell, Mary Katherine Tillman, Thomas Norris, Daniel Callam, Chrysogonus Waddell, Hans Urs von Balthasar, Pauline Matarasso, Paul Claudel, John Henry Newman, Cardinal Joseph Ratzinger, Philip Healy, Marguerita Lena, Lorenzo Albacete, Janine Langan, Antonio Sicari, Peter Casarella, and Christopher Dawson.